Amber Heard made a grand entrance dressed as the fictional character Mera at the Aquaman world premiere on Monday at Leicester Square in London, England. The 32-year-old actress wore a green gown with a plunging neckline along with a matching swim cap. The anticipated American superhero film, which also stars Jason Momoa, is set to hit theaters on December 21. Hollywood icon Julie Andrews secretly voiced Karathen in the movie, an undersea creature who holds the key to Arthur Curry’s. 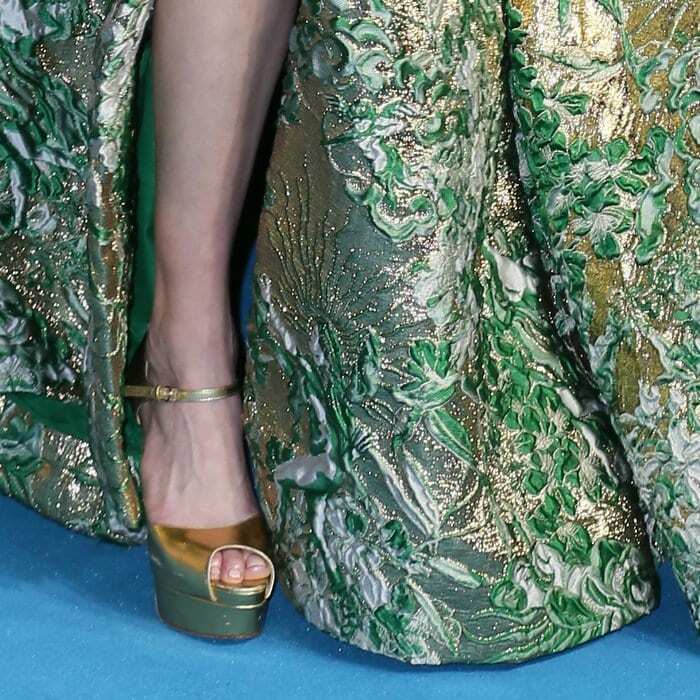 Amber perfectly embodied her character in a green and gold shimmering gown from the Valentino Fall 2018 Couture Collection. The 32-year-old actress totally looked like the Queen of Atlantis in this epic look. She completed the outfit with Beladora jewelry and gold Brian Atwood ‘Tribeca’ sandals that we’ve also spotted on Lady Gaga. The American actress also showed off her Spanish and Persian (also known by its endonym Farsi) body tattoos on her lower left back. Omar Khayyam was a Persian mathematician, astronomer, and poet, who died on December 4, 1131.